Ibn Wahshiyyah the Nabataean (Arabic: ابن وحشية النبطي‎‎), also known as ʾAbū Bakr ʾAḥmad bin ʿAlī (Arabic: أبو بكر أحمد بن علي‎‎) (fl. 9th/10th centuries) was an Iraqi alchemist, agriculturalist, farm toxicologist, Egyptologist, and historian born at Qusayn near Kufa in Iraq. He was one of the first historians to be able to at least partly decipher what was written in the ancient Egyptian hieroglyphs, by relating them to the contemporary Coptic language. Ibn al-Nadim (in Kitab al-Fihrist) lists a large number of books on magic, statues, offerings, agriculture, alchemy, physics and medicine, that were either written, or translated from older books, by Ibn Wahshiyya. His works on alchemy were co-authored with an alchemist named Abu Talib al-Zalyat; their works were used by Al-Dimashqi. In agriculture, the Filahât al-Nabâtiyyah (Nabataean Agriculture) of Ibn Wahshiyya is the most influential of all Muslim works on the subject. Written in the third/ninth century and drawn mostly from Chaldaean and Babylonian sources, the book deals not only with agriculture but also with the esoteric sciences, especially magic and sorcery, and has always been considered to be one of the important books in Arabic on the occult sciences. Ibn Wahshiyya translated from Nabataean the Nabataean Agriculture (Kitab al-falaha al-nabatiya; c. 904), a major treatise on the subject, which was said to be based on ancient Babylonian sources. The book extols Babylonian civilization against that of the conquering Arabs. It contains valuable information on agriculture and superstitions, and in particular discusses beliefs attributed to the Sabians - understood as people who lived before Adam - that Adam had parents and that he came from India. These ideas were discussed by the Jewish philosophers Yehuda Halevi and Maimonides, through which they became an influence on the seventeenth century French Millenarian Isaac La Peyrère. He wrote a toxicology treatise, the Book of Poisons, combining contemporary science, magic and astrology. 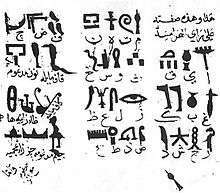 Ibn Wahshiyya was one of the first historians to be able to at least partly decipher what was written in the ancient Egyptian hieroglyphs, by relating them to the contemporary Coptic language used by Coptic priests in his time. An Arabic manuscript of Ibn Wahshiyya's book Kitab Shawq al-Mustaham, a work that discusses a number of ancient alphabets, in which he deciphered a number of Egyptian hieroglyphs, was later read by Athanasius Kircher in the 17th century, and then translated and published in English by Joseph von Hammer-Purgstall in 1806 as Ancient Alphabets and Hieroglyphic Characters Explained; with an Account of the Egyptian Priests, their Classes, Initiation, and Sacrifices in the Arabic Language by Ahmad Bin Abubekr Bin Wahishih, 16 years before Jean-François Champollion's complete decipherment of Egyptian hieroglyphs. This book was known to Silvestre de Sacy, a colleague of Champollion. Dr Okasha El Daly, at University College London's Institute of Archaeology, claims that some hieroglyphs had been decoded by Ibn Wahshiyya, eight centuries before Champollion deciphered the Rosetta stone. He published several cipher alphabets that were used to encrypt magic formulas. 1 2 Iovdijová, A; Bencko, V (2010). "Potential risk of exposure to selected xenobiotic residues and their fate in the food chain--part I: classification of xenobiotics" (PDF). Annals of Agricultural and Environmental Medicine. 17 (2): 183–92. PMID 21186759. Retrieved 13 June 2011. ↑ El-Daly, Okasha (2005). Egyptology : the missing millennium : ancient Egypt in medieval Arabic writings. London: UCL Press. ISBN 9781844720620. page 169. ↑ Houtsma, T. (1993). E. J. Brill's First Encyclopaedia of Islam, 1913-1936. 4. E.J. Brill. p. 1011. ISBN 9789004097902. Retrieved 10 December 2014. ↑ "Ancient Alphabets and Hieroglyphic Characters Explained: With an Account of ... : Aḥmad ibn ʻAlī Ibn Waḥshīyah, Ahmed ibn 'Ali ibn al Mukhtar ibn 'Abd al Karim, Joseph Hammer-Purgstall , Pforzheimer Bruce Rogers Collection (Library of Congress) : Free Download & Streaming : Internet Archive". archive.org. Retrieved 10 December 2014. ↑ McKie, Robin (2004-10-03). "Arab scholar 'cracked Rosetta code' 800 years before the West". The Observer. Guardian News and Media Limited 2007. Retrieved 23 May 2007. ↑ Whitman, Michael (2010). Principles of information security. London: Course Technology. ISBN 1111138214. Page 351. Ibn-Waḥšīya, Aḥmad Ibn-ʻAlī; Hammer-Purgstall, Joseph von (1806). Ancient alphabets and hieroglyphic characters explained: with an account of the Egyptian priests, their classes, initiation, and sacrifices. Bulmer. Retrieved 12 June 2011. Hamarneh, Sami K. (2008) [1970-80]. "Ibn Wahshiyya, Abū Bakr Ahmad Ibn ͑Salī Ibn Āl-Mukhtār". Complete Dictionary of Scientific Biography. Encyclopedia.com.